Live Video is one of the most important pieces of customer-engagement content available in 2017. You’ve probably already seen Facebook bring live video into the mainstream in the last two years or so. Now, it is set to explode on other social platforms as well. It may even become the face of many eCommerce and brick-and-mortar businesses. Live Video eCommerce marketing is something you need to consider for the remainder of 2017 and beyond. Viewers and search engines alike love video content. YouTube is the second largest search engine, and sites across the Internet are reporting huge boosts in interaction with their video content. Live video used to be reserved for webinars, but that is changing rapidly. In fact, many viewers feel that live video is the most compelling form of content on the Internet today. The research company, Cisco, estimates that video content will account for 82% of global internet traffic by 2020, which is up from 70% in 2015. 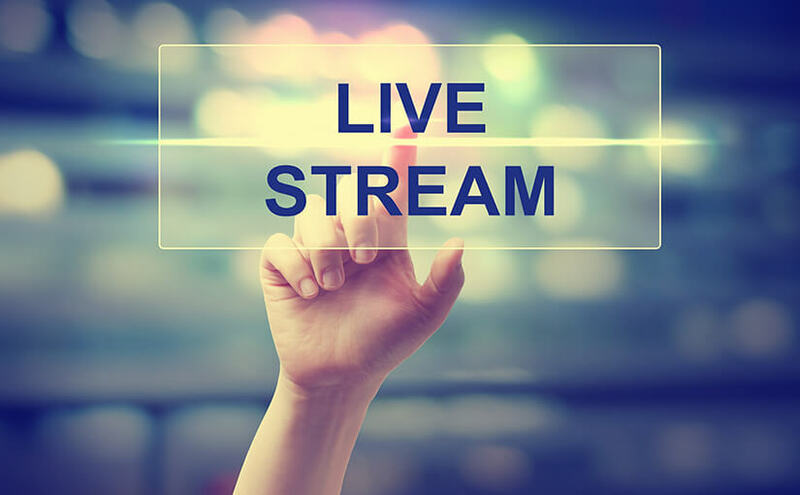 Consider that live video is quickly becoming the most popular video format, and, according to Forrester Research, receives three times more engagement than pre-recorded video. Before we dive into live video, what is the single most important benefit it provides? Live video allows brands to engage with audiences in an immediate, personal way. The content is (mostly) unscripted, and feels much more authentic than ‘canned’ content. Despite this clear superiority, live video is no more expensive than conventional video marketing. In fact, it might cost less in terms of time and money. All you need is a stable net connection and a camera that can shoot in HD quality. Today’s audiences demand expanded content, which includes live video, as it adds a human touch that text and images can’t compete with. A New York Magazine survey says 80% of respondents would rather watch live video from a brand than read a blog, and 82% prefer live video to social media posts. For many eCommerce businesses, a product launch is a perfect opportunity to implement the power of live video streaming. You’ve created the imagery, copy, social media content, and marketing materials for the new product. You’ve also announced it on your website ahead of time, posted on Facebook and Twitter, and maybe even sent out discount codes for pre-orders. Now, on the actual day of the launch, you tie it all together with live video. By streaming live video directly on your homepage, visitors will be instantly drawn to the content and have the best chance possible to be hooked by your new product. Special events for your business, like webinars, company outings, or conferences, also make great topics for live video. By allowing viewers to see how your company operates, you can differentiate your brand from the competition. Whether your content is moving, funny, informative, or a mix of all three, live video does more than almost any other type of content. How do I get started with live video eCommerce marketing? To get started with live video eCommerce marketing, you need an HD-ready camera (or microphone, if you’re only streaming audio). A quick look on Google shows that Full 1080p HD video cameras a remarkably affordable – especially when you consider the ROI of live video. Webcams are even easier for live streaming because you don’t need to use a video capture card. an encoder, which is a special hardware device or software package that converts your video to a live streaming format in real-time. You can also use a software encoder like Adobe Flash Media Live Encoder or Open Broadcaster Software. Next, evaluate who your audience is and how big it will be. For brands that may reach millions of viewers and want to implement a pay-per-view system, there are several hosts out there such as DaCast and Ustream. Most of you, however, will be embedding the live video directly on your website. There are plenty of free-to-embed streaming video players available, such as Flowplayer, Video LightBox, or JW Player. What platform is right for your content? Facebook Live is the default live video ecommerce marketing platform and will probably earn the most views for your content. We prefer it for face-to-camera videos, live-action shots, and staged studio broadcasts. For short, spontaneous videos at conferences, launches, or events, we like Twitter. Twitter has added Periscope functionality into its app, so now anyone can broadcast live on Twitter and reach audiences on both platforms. Unlike Facebook and Twitter, Instagram’s live video disappears after viewing, which increases the urgency of the content, but may reduce views. If you go with Instagram, remember that your live videos are running on platform best known for photography, so you’ll want to make your Instagram live streams colorful. YouTube Live will stream video from your webcam or desktop. This allows you to host webinars and broadcast vlogs in real time. You can also share your YouTube video on Facebook, SlideShare, and other networks. Remember the pay-per-view items we mentioned before? DaCast considered one of the best live streaming platforms. On it, you stream to the cloud, which reduces the pressure on your device space. It is simple to use and monetize your content. In conclusion, if you haven’t embraced live video eCommerce marketing yet, now is the time. Remember, live video is the hottest content on the Internet these days, and it’s easy to start streaming. Don’t forget the very real SEO benefits that come with video content as well. With live video, you’ll take your online marketing endeavors to another level. For more information about live video eCommerce marketing or to get started with your next project at DotcomWeavers, please contact us today!